Wednesday, Oct. 15, 2014, 7 – 8:30 p.m. The heart is a miraculous muscle. Yet every year for over one million people this vital organ quits. Heart muscle damage, most commonly caused by a heart attack, can lead to heart failure when the organ forms scar tissue rather than growing new muscle tissue. 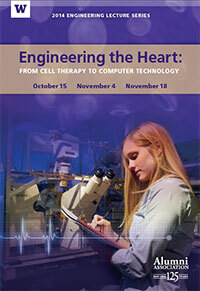 UW researchers, led by bioengineer and physician Charles Murry, are merging engineering technology, stem cells and medicine to regenerate heart muscle. The team recently published a significant breakthrough that brings us closer to addressing our nation and world’s top public health concern. Join us to learn how this treatment may save lives within the decade.